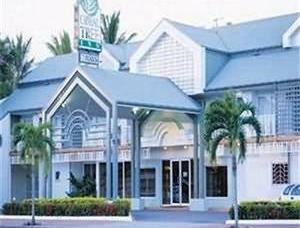 There are a lot of hotels in Cairns to choose from. 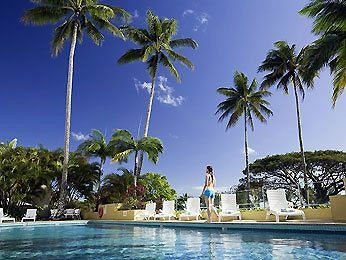 Most are luxury highrisers and many are either in the city centre or along the beachfront Esplanade, in central and north Cairns. Most are walking distance to the city but if you click on each you can check the exact location on a map (and see more photos and read more information). 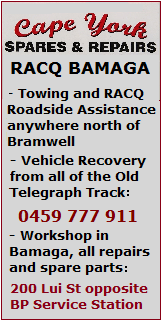 You can also make bookings, and in the end of the page you can search for more accommodation. 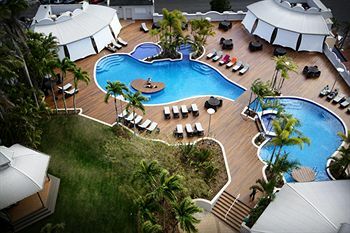 There are so many hotels in Cairns that I didn't get them all on here - the full list is in the Destination Guide with prices, addresses, contact numbers and full detail. 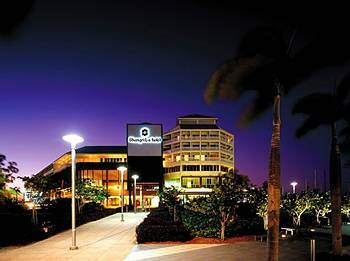 Right in the middle of the Esplanade in Cairns, a short stroll from the shops, restaurants, markets, nightclubs, and the Esplanade walking track, the Aquarius has an excellent location with great ocean views from your own balcony. There is also a swimming pool, tennis courts and a sauna. 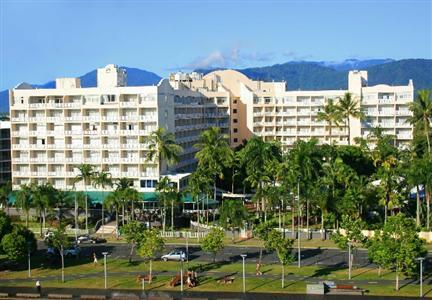 Best Western Acacia Court is right on the Cairns Esplanade with views over the ocean. 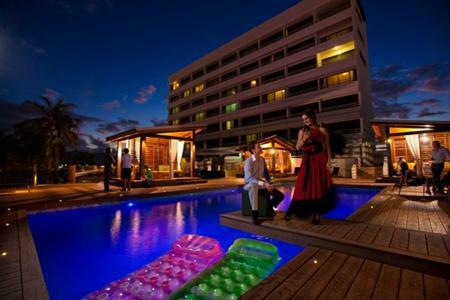 There is a swimming pool, tennis courts and a tour desk; and the rooms have balconies, TVs and kitchenettes. 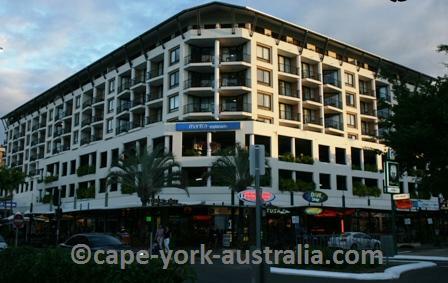 Cairns Plaza is another one of the central hotels - on the Esplanade. There are studio rooms, singles and doubles, with private balconies, fridges, tea and coffee making facilities, TVs and mini bars. There is also a bar and a restaurant. Another luxury one, Holiday Inn is in the corner of the Esplanade and Florence Street, a very nice location. All 237 rooms come with kitchenettes, mini bars, satellite TVs and DVD players, internet and in-room movies. There is a bar and a restaurant, a gym and a fitness room. On the corner of Shield street and the Esplanade, it is hard to find a better location for a hotel. Even the lagoon is just across the street. The rooms have kitchenettes, TVs, internet and balconies. In the complex, there is a swimming pool, a spa, a sauna, fitness rooms and a bar and a restaurant. Mercury Harbourside on the Esplanade is one of the central hotels. It has a garden, golf course, swimming pool, tennis courts, fitness room, massage and beauty centre, a bar and a restaurant. The rooms have coffee making facilities, fridges, TVs, wireless internet, computers, and direct dial phones. 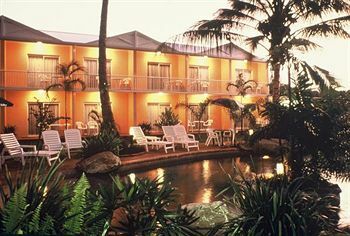 Rydges Tradewinds is on the Esplanade. The 246 rooms have private balconies, mini bars, direct dial phones, TVs, in-room movies, safe boxes, room service, and daily newspaper service. There's a pool, a spa, fitness facilities, massage, bar, internet cafe and undercover parking. 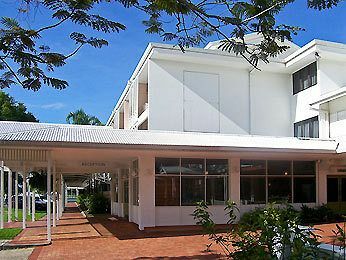 Country Comfort Sunlodge is in the central Cairns on the corner of Lake and Florence Streets. This is walking distance to the Esplanade and the centre of the city. It is a low rise, motel style building that has rooms with TVs, minibars and tea and coffee making facilities. There is a bar and a restaurant, and room service. 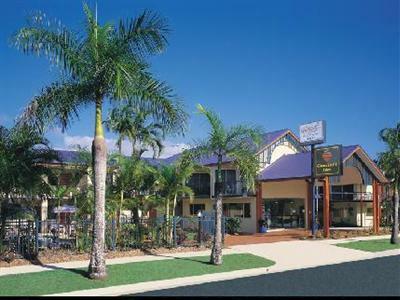 Mid City Luxury Suites is one block from Cairns Central Shopping Centre. It has a swimming pool, a garden and off street parking. The rooms have kitchenettes, mini bars, TVs, CD and DVD players and high speed internet. The rooms are non smoking but there is a designated smoking area. This hotel is one block south of the Esplanade. The air conditioned rooms have tea and coffee making facilities, mini bars, cable TVs, CD and DVD players and data ports. In the complex there is a gym and a spa, an outdoor swimming pool, free parking, a bar and a restaurant. This hotel is in Lake Street, one block back from the Esplanade. It has self contained units with modern kitchenettes with tea and coffee making facilities; private bathrooms and climate control. There is a guest laundry, a BBQ area and a swimming pool. Children under 14 are free to stay with parents. 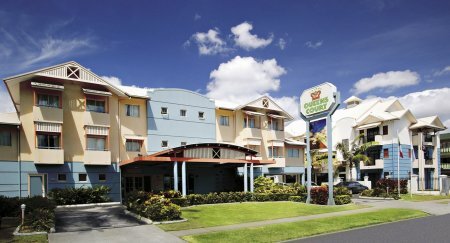 Rydges Plaza is located in the corner of Spence and Grafton Streets in central Cairns. The 101 rooms have private balconies, kitchenettes, mini bars, cable and satellite TVs, in-room movies and direct dial phones. There is a swimming pool, a sauna and fitness facilities. 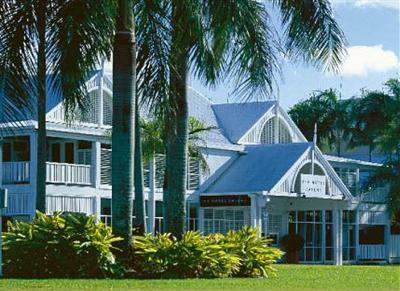 Coral Tree Inn is three blocks away from The Esplanade on Grafton Street. 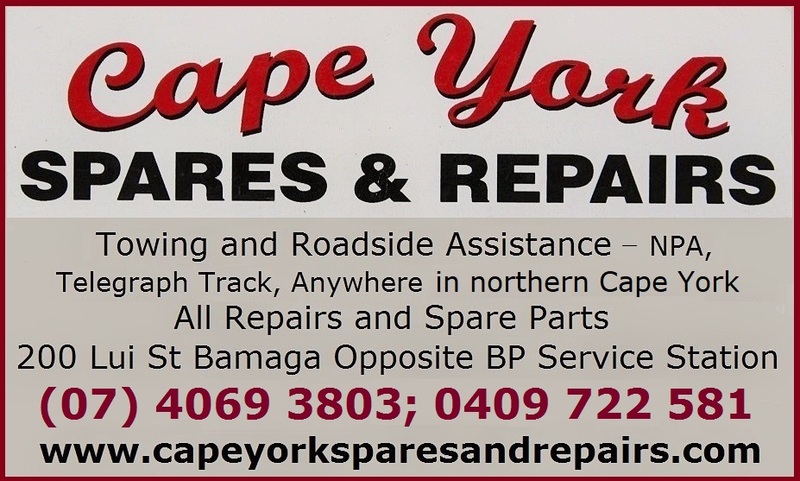 This is a good location with walking distance everywhere in the city. The rooms have a TV, and a kitchenette with a fridge and tea and coffee making facilities. There are BBQs, a swimming pool, landscaped gardens and off street parking. Four blocks away from the Esplanade and the heart of the city centre, the All Seasons Sunshine Tower is on the busy Sheridan Street. Standard rooms have fridges and tea and coffee making facilities while luxury rooms have kitchenettes and own balconies. There is a restaurant, outdoor swimming pool, a heated spa, a tour desk and BBQs. This lodge is located on the busy Sheridan Street. It's a bit away from the city centre, but in a walkable distance if you don't mind walking - and there are buses too. The rooms have kitchenettes with a fridge and tea and coffee making facilities. There is a restaurant, a pub, a swimming pool, a spa and parking. This is another hotel that is on the busy Sheridan Street. The 74 luxury, deluxe and execute rooms have kitchenettes, mini bars, balconies, internet access and cable television. There are babysitting services, parking, airport transfers, a swimming pool and an on-site restaurant. Queens Court is located on Sheridan Street. There are 81 self contained rooms and studios with coffee and tea making facilities, fridges, air conditioning and cable television. 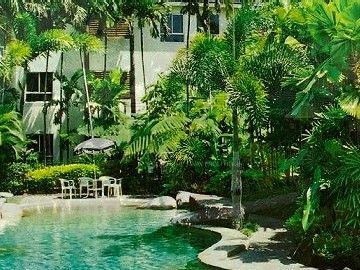 In the tropical gardens there is a swimming pool. Rainbow Inn is on the busy Sheridan Street. It has 90 modern units with apartment, standard and budget rooms. The rooms have kitchenettes, cable TV, mini bars and private balconies. There is also a swimming pool, a spa and an on-site restaurant. Sunshine Tower is also located on Sheridan Street. There are 61 rooms, some have full kitchenettes while others have coffee and tea making facilities and balconies. There is an outdoor swimming pool, a heated spa, BBQ facilities and an onsite restaurant. 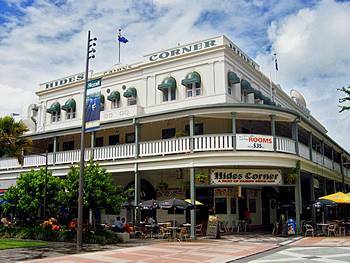 Hides is the most beautiful of the old hotels, located right at the City Place - as central as it can get in Cairns. There are 102 guestrooms in this building, each with a/c, TV, internet, safes, fridges, coffee makers and bathrooms. There are also guest laundry facilities, a tour desk, a swimming pool and a dive training pool. 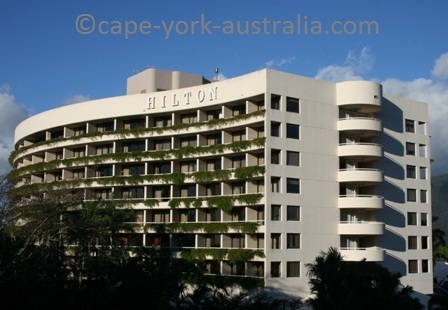 Hilton in central Cairns has rooms with private balconies, kitchenettes, mini bars, satellite TVs, video games and safes. There is a swimming pool, a gym, sauna, a massage and beauty centre, a gift shop, a cafe, a restaurant, and a bar and a grill. 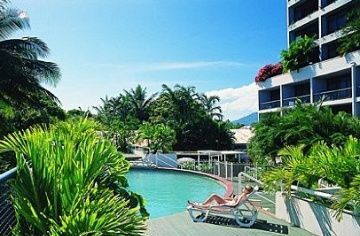 Pacific International is in the north-eastern end of the Esplanade, close to Cairns Marina. There is a restaurant, a bar, an outdoors swimming pool, free parking and internet access. The rooms have balconies, mini bars, cable and satellite TVs, and tea and coffee making facilities. 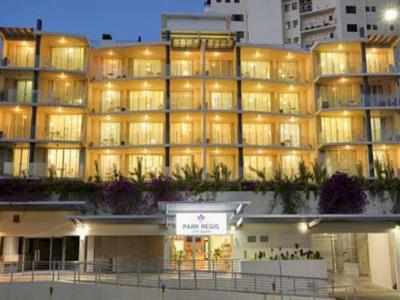 Park Regis is near the Reef Casino and Wharf Street in central Cairns. It has one and two bedroom self contained apartments with private balconies, full kitchen and laundry facilities, cable and satellite TVs, and internet access. There is a rooftop swimming pool, and an off-street parking lot. 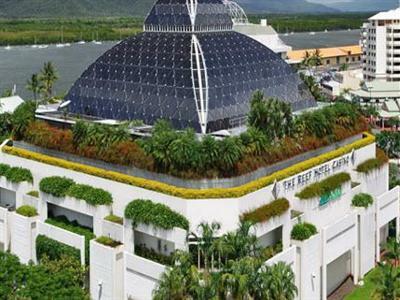 This is the hotel in the Reef Casino. The five star establishment has all the luxury you would ever dream of. The 128 luxury rooms have kitchenettes, cable TV and internet. In the building there is a casino, bars and restaurants, a massage centre, a sauna, a fitness centre, a beauty centre and a spa. Shangri La is next to the Pier and Cairns Marina. 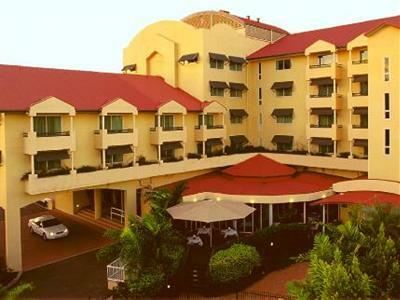 The 225 rooms have tea and coffee making facilities, mini bars, flat screen TVs, private balconies, spacious bathrooms, internet access and safe deposit boxes. There is a sundeck, a swimming pool, a fitness centre and a massage and a beauty centre. 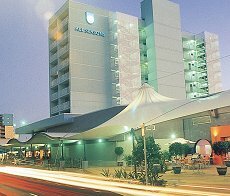 This fantastic five star hotel is across the street from the Reef Casino. The 321 rooms have coffee and tea making facilities, mini bars, cable TVs and in room safes. There is a gym, a sauna, Jacuzzy spas and swimming pools, as well as valet service and undercover parking.